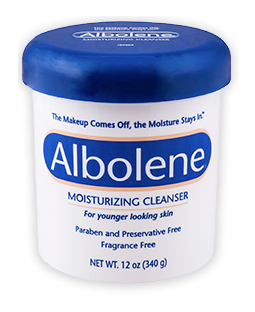 Albolene® Moisturizing Cleanser is a makeup remover that easily removes stubborn mascara and lipstick, yet leaves skin feeling soft, supple, and moisturized. Albolene is also an effective and gentle cleanser. It’s the beauty industry’s best-kept secret as this multi-use product has been helping keep skin beautiful and younger-looking for generations! What Makes Albolene Different – and Better! Independent clinical studies demonstrate that Albolene’s combined “Makeup Removal Index” and “Moisturizing Index” are significantly higher than the competition1. Albolene is strongly recommended for use every day to help keep skin healthy by gently removing makeup, dirt, and environmental residue. Using Albolene daily can not only rid the skin of makeup and residue, but it can also protect the skin’s outermost layer from becoming dry and damaged. Because of its high moisturizing content, Albolene can help prevent dehydrated or irritated skin. Daily use of Albolene can promote vibrant, healthy skin and a younger-looking complexion. Albolene is paraben and preservative free. Learn More About the benefits of Albolene!